Your service pages are an important part of your site, in that they describe the different services you provide in detail to the customer. These pages have been designed in a way that both takes care of Google's standards for a website, and makes sure that the customer stays on your page and continues to see your information on any page they go to. 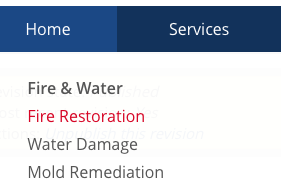 To see how that works, go the the menu at the top of your page, highlight "Services" and click on "Fire Restoration" inside the part of the menu that appears. The customer thinks they're on your website (and they are), but they are actually looking at the main website for the brand at https://rainbowintl.com/fire-restoration. The "?fid=" part changes the page to make it look like yours. Why is this important? Google dislikes Duplicate Content, which are identical pages on a website. Since you show this page for the main website for your customers in this way, we follow Google's rules, and it's good for all franchisees. It's possible that https://rainbowintl.com/fire-restoration does not cover all the services you specifically provide in the way you'd like to present them, and if that's the case, we can replace this page with one you provide the content for. But, in order to follow Google's rules about duplicate content, it's important to note that we can't change individual details in the current page. Service page changes mean you must provide a whole new rewritten page for us to publish. If you have something written that does a much better job in your area covering the details of your service, please do sent it to us. We're happy to look it over for use on your site. Note that you don't have to do any special formatting or write any code, as we can take care of that for you.